Home“Dirty money”: are you getting the right change from microbe-contaminated money? “Dirty money”: are you getting the right change from microbe-contaminated money? In reality, we shouldn’t be surprised that bank notes and coins are contaminated with various bacteria. After all, we hardly expect them to be sterile. Our own hands are colonized with millions of bacteria and money is the most frequently passed item in the world. All studies that I have come across investigating bacterial contamination on money (paper notes or coins) have found a significant proportion to be contaminated (53-100%). I suspect that the microbiological techniques used in the various studies impacted on the results and my personal view is that the majority if not all money commonly exchanged between people will be contaminated. It is expected that bacteria will be found on bank notes and coins regardless of which country the money is from. Studies from Mexico, USA, India, Saudi Arabia, Nigeria, Kenya, Burma, China and Turkey to name few have all found significant contamination on their money. The type or bacteria found on money includes [deep breath]: E. coli, Vibrio spp., Klebsiella spp. including K. pneumoniae, Serratia spp., Enterobacter sp., Salmonella spp., Acinetobacter spp., Enterococcus spp., Staphylococcus including S. aureus, Bacillus spp., Staphylococcus epidermidis, Streptococcus pneumoniae, Proteus spp., Pseudomonas spp. including P. aeruginosa, Shigella spp., Corynebacterium, Lactobacillus spp., Burkholderia cepacia, Micrococcus spp. and Alcaligenes. Looking at this list, it is clear that some of these bacteria are common environmental bacteria considered non-pathogenic. However, many are either potentially pathogenic or common human pathogens. For example, K. pneumoniae is a virulent organism and may cause both community and hospital-acquired infections. Even those organisms not commonly associated with disease in healthy hosts can cause clinically significant infections in immuno-compromised and hospitalised patients. These include even the natural inhabitants of the human skin such as Staphylococcus spp. The story doesn’t end there since a number of studies have found multidrug-resistant and virulent strains on money. These have the potential to cause serious infections that are hard to treat, to disseminate in healthcare and community settings, and to spread antimicrobial resistant determinants to other bacteria. For example, one study3 found substantial S. aureus colonies on all 8 of the $1 and $5 bank notes collected from and around a University hospital in the USA. Tests for the presence of β-lactamases were positive and a significant number of the colonies showed resistance to erythromycin, tetracycline, chloramphenicol and vancomycin. Two isolates showed high-level resistance to vancomycin were found to harbour a plasmid conferring resistance to the drug. Taking that vancomycin is one of the last line antibiotics for treating multidrug resistant infection, this finding is very alarming. [A cautionary aside though – this work was published in the ‘Journal of Young Investigators’, so I can’t help thinking that the high-level resistance to vancomycin warrants some further investigation.] In another study,4 virulence genes were detected in S. aureus isolated from paper currency in India. Four virulence genes (cna, icaA, hlg and sdrE) were found in the isolates with 8 isolated possessing all 4 genes. Isolates harbouring these virulence genes showed higher antimicrobial resistance than those which didn’t contain these genes. Bacteria are not the only organisms found on money. 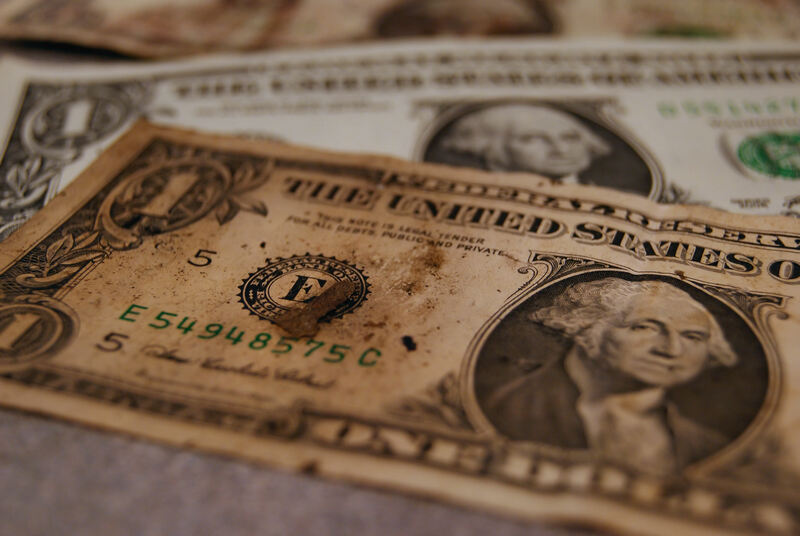 A number of studies show that fungal contamination of money is also common. Some of these are potentially pathogenic to humans and other life forms including plants. This may have implications far beyond human health to economic consequences if non-native pathogenic species are introduced into different countries via money carried during travel. For example, studies have found Penicillium spp., Aspergillus niger and A. flavus, Candida spp., Fusarium spp., Rhizopus spp., Alternaria spp, Trichoderma virie and white and brown mycelium on money.5.6 Some of these fungi can cause serious infections in humans and diseases in plants. In some countries, even parasites have been identified on bank notes. One study1 from Nigeria found that of the 250 currency notes collected from 4 major cities in the country, 21.6% were contaminated with enteric parasites including Ascaris lumbricoides, Enterobius vermicularis, Trichuris trichiura and Taenia spp. This parasite-contaminated currency was most frequently found in notes obtained from butchers and beggars. In another study,7 60.2% of 103 banknotes and 56.6% of 99 coins obtained from food-related workers in Egypt were found to be contaminated with one or more parasitic species. Protozoa were the predominant parasites, with microsporidia and Cryptosporidium spp. being the most prevalent. 2- How long are organisms able to survive on money? The survival of organisms on money depends on the type of the organism and their environmental resilience, the environmental conditions and the type of material the money is made of. Banknote paper is manufactured from cotton fibre, which gives the paper its strength and durability. Other additional elements maybe added to the cotton. Ploymer (or plastic) bank notes were developed to improve durability and incorporate some security features. One study8 investigated survival of MRSA, VRE and ESBL-producing E. coli on various bank notes from around the world including Euro, Croatian Kuna, Romanian Leu, Moroccan Dirham, US Dollar, Canadian Dollar, and the Indian Rupee. They found that the 3 organisms survived on the Romanian Leu for 6 hours after drying and VRE was isolated from the same notes after one day of drying. Other currencies had variable survival rates. Another in-vitro study4 found that S. aureus was able to survive on Indian paper currency for 8 days at room temperature. 3- Are organisms able to be transmitted from money? Transmission of organisms from money is highly significant if it occurs. For example, transmission from the community to the hospital setting is relevant because normally non-pathogenic, or opportunistic pathogens can have a serious clinical impact in such settings. On the other hand, transmission from the healthcare environment to the community is relevant when antimicrobial resistant strains (commonly found in hospitals) are involved. A study mentioned above,3 found vancomycin-resistant S. aureus on bank notes. The resistant determinant was located on a plasmid, hence easily transferrable. Notwithstanding my reservations about this study (see above), the interesting point about this investigation was the sources of the bank notes tested. These were collected from a University Hospital’s gift shop, a snack cart outside the hospital’s door and a convenience store near the hospital. The vancomycin-resistant isolates have likely originated from the hospital where the antibiotic is commonly used and had been transmitted to outside the hospital on money. In another study,8 investigators artificially contaminated bank notes of a number of countries with S. aureus and E. coli, and investigated transmission after 3 subjects with disinfected hands came into contact with these notes. Transmission was not successful for the Euro notes but transmission from US Dollars and the Romanian Leu was observed. So we probably should be concerned with contamination of money especially when virulent, pathogenic or multidrug-resistant strains are concerned. Transmission between the healthcare and community settings can also have important implications. What’s the solution? Disinfection of the currencies in banks with UV light, supersonic or chemical means, producing bank notes from materials which inhibit bacterial growth or material with antimicrobial activity as well as replacement of traditional methods of trading with electronic money transactions, have all been proposed. Personally I think for now, proper hand hygiene and overall hygiene remain the best ways to counter this problem. Uneke CJ, Ogbu O. Potential for parasite and bacteria transmission by paper currency in Nigeria. J Environ Health. 2007;69:54-60. Nisbet BR, Skeoch T. Bacteria on bank notes. Med Off. 1949;81:225. Bhalakia N. Isolation and plasmid analysis of vancomycin-resistant Staphylococcus aureus. J Young Investigators. 2005. Wanule D, Jalander V, Gachande BD, Sirsikar AN. Currency notes and coins as a possible source of transmitting fungal pathogens of man and plants. J Environ Sci Eng. 201;53:515-8. Kuria JK, Wahome RG, Jobalamin M, Kariuki SM. Profile of bacteria and fungi on money coins. East Afr Med J. 2009;86:151-5. Hassan A, Farouk H, Hassanein F, Abdul-Ghani R. Currency as a potential environmental vehicle for transmitting parasites among food-related workers in Alexandria, Egypt. Trans R Soc Trop Med Hyg. 201;105:519-24. Gedik H, Voss TA, Voss A. Money and transmission of bacteria. Antimicrob Resist Infect Control. 2013;2:22. ← Could universal glove use provide a false sense of security? The solution is – more money-laundering! The root to the question is: How many people got infected by dirty money and became ill? And the severity of such illness? Is this a real problem that needs solving?